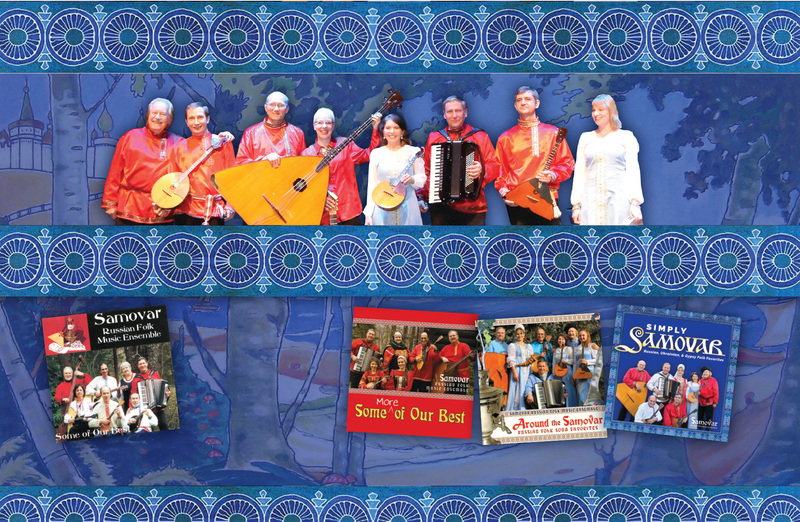 Samovar Russian Folk Music Ensemble plays an extensive repertoire of Russian, Ukrainian, and gypsy (Romani) folk music. Based in the Washington DC area, the group has played extensively throughout the region as well as internationally. Together since 1996, their colorful costumes and heartfelt traditional tunes have been a favorite at venues including the Kennedy Center Millenium Stage, the US Botanic Garden, the Russian and Ukrainian Embassies, Hillwood Museum, and many more. Samovar is available to play at your function using as few as two or as many as seven musicians. Please enjoy a sampling of our music, as well as some pictures and video from past events. Then contact us to play at your next party or event! Samovar was asked to act as the warm-up band for the National Symphony Orchestra’s all-Russian program at the Kennedy Center on Friday, November 2. If you missed us there, you can still hear us at Hillwood Museum’s Winter Festival, Saturday, December 8 and Sunday, December 9, an all-day fun event which feature the Kalinka Dancers, Grandfather Frost, and lots of activities. Our final public concert of the year will be at the US Botanic Garden on Tuesday, December 11, 6 – 8 pm. Hope to see you! Site design by Smallaxe Studios.